How do some books get noticed and end up on supermarket shelves while other books–just as good or better–find themselves languishing in the backwater? It’s a mystery to me. 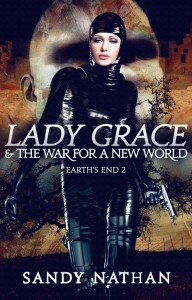 The other day, I looked at my reviews for Lady Grace & the War for a New World. Lady Grace is one of three books in the Earth’s End Trilogy, my highly original, dystopian (happens after nuclear Armageddon) thriller/romance/extraterrestrial-ridden series. 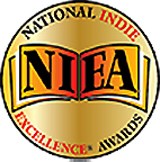 The Trilogy has won seven national awards–the Gold Medal in Visionary Fiction from the huge and prestigious IPPY Awards among them. The books have gotten close to five star ratings on Amazon. And yet, they’re unknown. JIM CHAMBERS IS THE #2 REVIEWER ON ALL OF AMAZON! “After reading The Angel & the Brown-eyed Boy, I had to wait almost a year for Lady Grace, the sequel, to be published. It was worth the wait. As much as I enjoyed the freshness and originality of the first book, Lady Grace was even better. When the story began, hundreds of years have passed since the earth was devastated by a nuclear conflagration. Jeremy and Ellie and their friends have been transported back to Earth, near the bunker beneath the now destroyed Edgarton manor. Jeremy’s mom, Veronica Edgarton, has been reunited with Jeremy. The descendents of village chief Sam Baahuhd have survived and proliferated in the bunker, but at a terrible price – many have mutated into monsters who terrorized and tortured their kinsmen. “That’s the setting for the story. Sam Baahuhd had been dead for centuries, but one of his descendents, also called Sam, had all of the original Sam’s good qualities. When Sam was rescued by Jeremy and the others, he met Veronica, which was the beginning of a poignant love story set amidst the turmoil as the small band of survivors made their plans to attack the bunker and save Sam’s unmutated kinfolk. Jeremy and Ellie were still deeply in love, but Jeremy and the others had no inkling of the dramatic changes that Ellie would soon undergo. “Lady Grace was first-rate science fiction and one of the most absorbing page-turners of that genre that I’ve read in years. Author Sandy Nathan exhibits the imagination of Ray Bradbury combined with the whimsicalness of Douglas Adams. That’s high praise, but it’s warranted. The story includes so much action; tense, suspenseful drama; and two charming love stories that it’s irresistible. YOWSER! People wait a lifetime for a review like that from anyone, much less the Number Two reviewer on Amazon! You can get the eBook dirt cheap on Amazon, but I’ll be working on more promotions in the near future. Bring the Lady out of the shadows! Shoot, check out the entire Trilogy! The cover to the Trilogy is below. Get all three books at once: close to a thousand pages of fascinating adventure. Romance. Danger. Stuff so scary you won’t sleep for months. Funny! Let me tell you about funny. And spiritual. Sandy Nathan’s Books Are Stuck at 99c The Sale Won’t Go Away! Talk about technical problems! 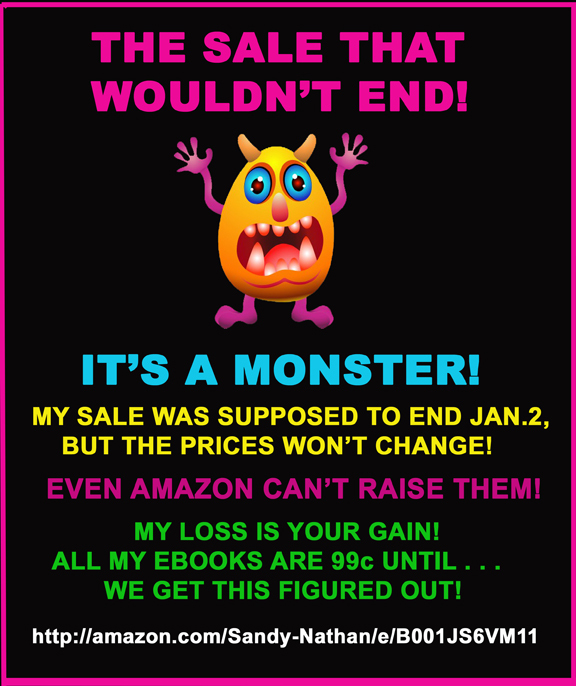 My eBook sale was over on January 2, 2013. Except it’s not. When I changed the prices on my control panel, they didn’t change. I did it again. And again. And contacted Amazon. They couldn’t figure it out. So, I’m stuck practically giving away my six eBooks. Between them, they’ve won 24 national awards and garnered 55 five star and 13 four star reviews. Go to my author page and check out my six Kindle books, each for sale for a measly 99 cents. They will be until I figure out this technical glitch. And then–––THEY’RE GOIN’ UP! HO! HO! HO! 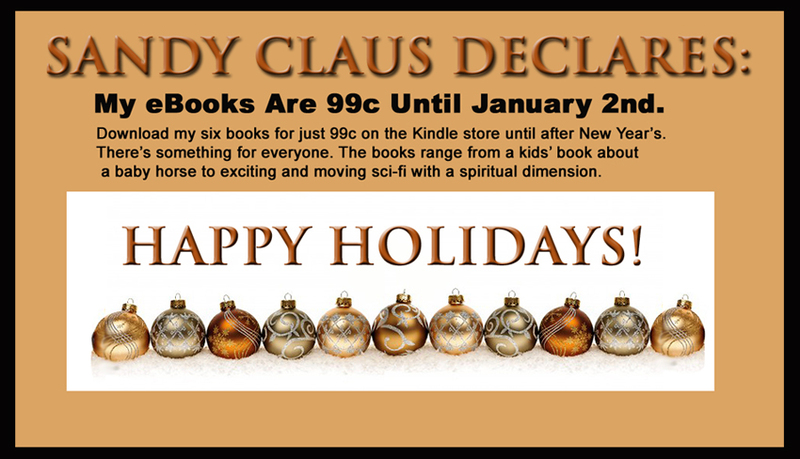 SANDY CLAUS HAS MARKED ALL HER EBOOKS DOWN TO 99c EACH UNTIL JANUARY 2, 2013! HERE’S MY AMAZON PAGE. ALL THE BOOKS ARE LISTED THERE WITH HOT LINKS. YOU CAN ALSO CLICK ON THE IMAGE. ENJOY!